Archcore steel has a nationwide reputation for designing, constructing and installing industrial steel buildings on a large or small scale. You can save valuable time on the construction of your new facility by using an Archcore industrial building because they are completely pre-engineered for simple fast assembly. 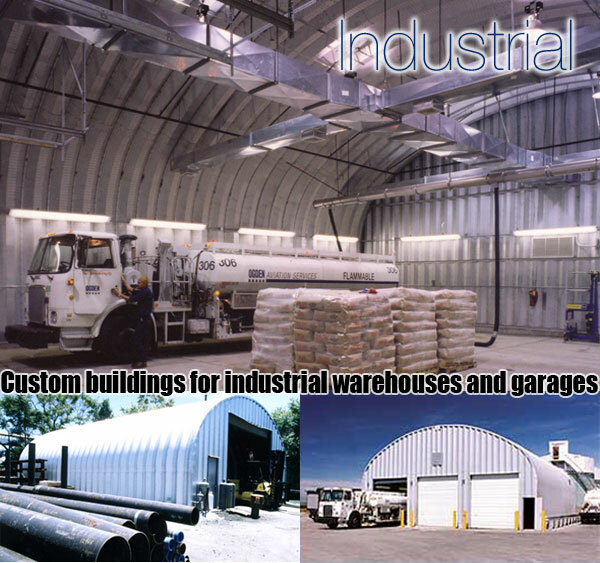 Archcore industrial steel buildings are 100% made in the United States and backed with a 35 year warranty. Our pre-fab Industrial buildings are extremely popular for future expansion. Simply remove an existing endwall, and add additional length, then replace the existing endwall back in place. It's that easy! We only use Galvalume steel with the highest tensile strength, so our buildings are 7 times more rust resistant than the galvanized steel used for years in older buildings. An industrial steel arch building is noncombustible, making it a safer choice for businesses with heavy chemical use or hazardous waste pre-fabricated storage building needs. Our small steel utility buildings stand up to "Mother Nature" in the long term far better than traditional wood pole building kits and plastic or vinyl storage sheds. They do not start to deteriorate and fall apart after only one or two winters like a typical wooden backyard shed. Archcore's industrial buildings are perfect for a wide variety of standard metal building applications, yet versatile enough to be customized and tailored to specific project requirements.